This is another example of Internet-powered public opinion monitoring the government in China. The item below is a Tianya forum post that has received more than 280,000 page views and more than 11,000 comments after being first posted on May 29, 2006. In less than ten days, the public pressure forced the responsible government department to apologize and retract its decision. The targeted government department is smallish, which meant that it could not stop the national public opinion outbreak. If the target was bigger, this item might have been shut down on the Internet. (Tianya) An impoverished grandmother was detained five days for picking up 28 empty bottles on the train. May 28, 2006. At the end of March this year, my mother was taking care of her 3-year-old granddaughter who was getting treated for leukemia at the hematology department of the Changsha Xiangya Hospital. 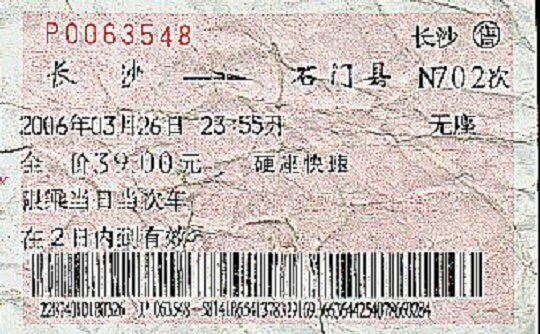 Because more money was needed in order for the child to continue treatment at the hospital, my mother purchased a ticket for the Changsha-Shimen N702 train to go home around noon March 26 so that she can raise money there. Either she was old or hungry, as well as the negligence by the ticket and train inspectors on two occasions, my mother got on the wrong train. She should have returned home in four hours, but instead it took her close to 20 hours. At 1pm March 27, my mother finally reached the destination of Shimen. At the exit, a man named Zhang stopped her and identified himself as a "special agent" of the railroad department. This man informed my mother: "Although you have a train ticket, the Railroad Department has issued an internal memorandum that scavenging is not permitted on trains." During more than five hours of note-taking, testimony and examination, my mother pleaded again and again: "My granddaughter is only three years old. At the age of two, she had heart surgery. We have not paid off our debts yet, and now she has leukemia. I was forced to collect the bottles. I did not see any notices from the railroad department either at the train stations or on the trains. The public announcement systems did not say anything. The police officers and service workers on the train did not say anything or stop me. I really didn't know. I hope that you can lessen the penalty. My granddaughter is still at the hospital waiting for money to save her life! If you don't believe me, you can call to confirm." In the face of the pleas from my mother, the special agent was unmoved: "The whole point was not to let you people read the notice, for how else can we catch you?" The net result of all the pleas was this sentence -- a heavy penalty of five days of detention. At the same time, the special agent was too busy to issue a written report to the public security administration. After the note-making was completed at around 6pm on March 27, he sent my mother to the local public security detention center. The next day, the Guangdong Railroad "Iron Eagle Action Group" asked the Huaihua Public Security Department, which in turn asked the local public security bureau to handle the matter. At around 9am, the "public security administrative penalty decision" was sent to the detention center and the worker demanded that my mother sign and forced her to write down 'March 27th' as the date. The administrative penalty decision read: "On train 1474 ... discovered at the scene by train police." Actually, my mother was intercepted at the ticket inspection exit. At the time, the special agent was at the Shimen train station, and not on the train. My mother was a peasant who graduated from a professional secondary school. In the 1980's, she graduated from an agricultural professional school and heeded the call of the Party to tend farmlands for forty years. She has never asked our Party and our government for anything. To save money, she waited and rode the train for more than 20 hours with only two cold buns to eat. To save money, she did not eat for the first three days in the detention center. She naively believed that if she did not eat, she would not have to pay for food! In the end, she still had to pay the 175 yuan for food and lodgings plus a 400 yuan security deposit before she was freed. After this physical trial, she came home and fell sick herself, quite unable to take care of her sick granddaughter. This matter took place more than two months ago. We have complained to many media organizations for help. But the relevant departments and certain government leaders took "special attention" and made sure that this case was not reported. When a common citizen's family is in serious difficulties, should Mr. Special Agent be a bit more humane? A legal traveler unknowingly took 28 'dangerous' empty bottles in her luggage when she exited the train station. Did this action seriously disrupt social order and deserve five days of detention? The local public security bureau took 400 yuan as security deposit. What is this supposed to secure? To guarantee that she won't scavenge anymore? Respected Railroad Department, can your secretly operating "departmental regulations" be disclosed to the public? (Ta Kung Po) Hunan Public Security Apologizes To Elderly Female Scavenger. June 8, 2006. An elderly woman from Shimen county, Hunan province, picked up some empty bottles on a train and was arrested by railroad employees. She was sent to the detention center and had to pay 400 yuan in security deposit and 175 yuan for food and lodgings before she was freed. The family of the woman published the incident on the Internet, and the media and netizens launched protests against the abuse of power by the authorities against socially vulnerable groups. In the face of the overwhelming and one-sided public opinion, a deputy director from the Hunan Shimen county public security and other workers went yesterday to the home of the elderly woman to apologize and rescind the administrative penalty. Here is how the incident occurred. 59-year-old Teng Ziying from Linfeng county, Changde city, Hunan province took the train on March 26 from Changsha back to her home in Linfeng to raise money for the medical treatment of her granddaughter, who has leukemia. During the trip, she collected 28 empty bottles. When she got off the train at Shimen county station, she was stopped by a station worker and then brought to the office for investigation. Afterwards, the Shimen county train station public security bureau worker claimed that the "internal regulations" formed the basis of the action. On the slow trains, there are often thefts and robberies. Therefore, the railroad department has begun large-scale clean-up operations on the "green-colored" trains. According to the "internal regulations," scavenging on the train was one of the activities to be cleaned up. After the Huaihua railroad public security personnel observed the elderly woman picking up empty bottles, he followed her and then intercepted her at the Shimen county train station. He recommended a penalty of ten days of detention to the public security bureau. The local public security bureau approved an administrative detention of five days. Teng Ziying claimed that she was unaware that the railroad has regulations against picking up empty bottles. When she was picking up empty bottles, the train personnel did not stop her. So she pleaded not to be penalized. Yet the railroad public security case agent stated grandly: "The whole point was not to let you people know, so that we can catch you." So Teng Ziying was sent to the Shimen county public security detention center on the grounds of "disrupting public order on the train." The next day, Teng Ziying went down with fever and stomach aches. 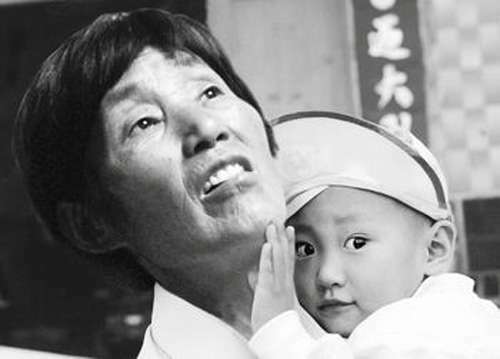 She was able to call her daughter and son-in-law in Shimen county in the presence of the detention center workers. It was then that her family learned that she had been detained. Teng's son-in-law and family came to the detention center and paid the 400 yuan security deposit and 175 yuan for food and lodgings, and then Teng was allowed to leave the detention center. When Teng Ziying's family complained to the media but failed to get justice, her son posted a narration of the incident on the Internet. At the same time, he wondered strongly: Is picking up 28 empty bottles "seriously disrupting public order"? Does that merit five days of detention? Why can't the "internal regulations" of the railroad department be disclosed to the public? 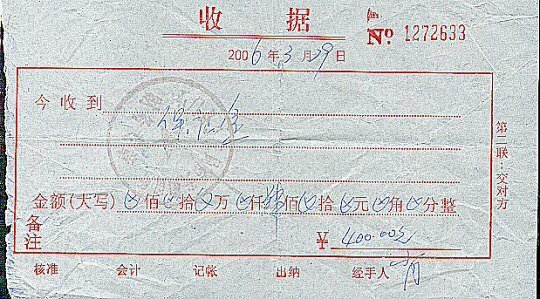 After the public security detained someone, why do they have to have an penalty of 400 yuan for "security deposit"? The experience of Teng Ziying generated massive sympathy from netizens. All the news media joined in to condemn the abusive behavior of the Huaihua railroad public security bureau. According to reports, under the pressure of public condemnation, the leaders from the Huaihua Railroad Public Security Bureau Shimen Train Station and the Shimen County Public Security Bureau went on April 23 and May 10 to offer their sympathies to Teng Ziying at her home and even offered to donate 2,000 yuan and 4,000 yuan for the medical treatment of Teng Ziying's granddaughter. But Teng rejected the offer. Teng said: "The goal is to get a public statement, not just for a few thousand yuan." 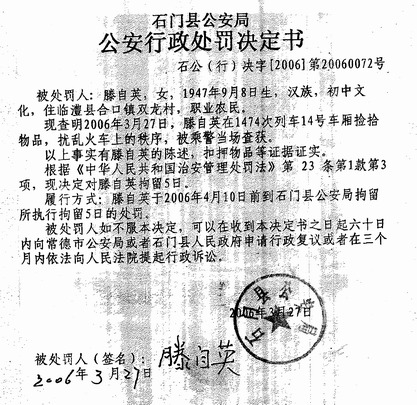 After more than two months of the public calling law enforcers to have a human conscience, a deputy director from the Hunan Shimen County Public Security Bureau came on the morning of May 7 once again to the home of Teng Ziying to apologize and to deliver a document that officially rescinded the "administrative penalty decision." He also returned the food and lodgings fee and security deposit that Teng Ziying had previously paid. Teng Ziying's son Cao Yongsheng said that his mother and the family are satisfied with the attitude of the Shimen county public security bureau in handling the matter and rescinding the penalties. But he called for the railroad department to work from the premise of building a harmonious society to protect the fundamental interests of the masses and truly serve the passengers. He reminded the railroad department workers that when they enforce the "internal regulations," they should consider not just whether there is a violation of national laws but also about social morals and human conscience.